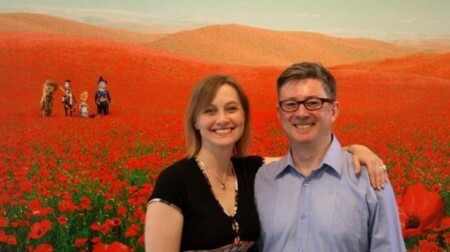 Kristin Makholm with British artist Graham Rawle and the Cowardly Lion, the Scarecrow, Dorothy, Toto, and the Tinman in the field of poppies. Frankly, the news that MMAA was hiring a new director at all came as something of a surprise to me–last I’d heard, the institution’s very future was in doubt. With all the misfortune hitting arts organizations in recent months, hearing about the MMAA’s plans for revival is heartening news, indeed. In spite of its recent troubles, the museum has been a valuable addition to the Twin Cities (and, in particular, St. Paul’s) contemporary art landscape, particularly for its impressive (albeit too rarely seen) permanent collection of artwork and an admirably enduring commitment to showcasing work from regional artists. Kristin Makholm will assume her new post at the MMAA quickly, on June 22, so before she’s swamped with the tasks of settling in to her new job, we hit her up for some information and insight–about the MMAA’s new plans, her new role in and vision for the museum, and what we can expect from the institution as it regroups and moves forward. What prompted you to make this move from an influential position in a nationally known educational institution to take the helm at MMAA, by all recent accounts a struggling organization? And why now? KM: My background is as a museum curator, and I always knew I’d want to return to the museum someday. I’ve been at MCAD almost five years, plenty of time to make my mark on a thriving college art community and to develop my knowledge of local and regional artists, especially through the McKnight and Jerome fellowship programs. Why now? Due to the MMAA’s leadership vacuum and loss of its building, it needed someone now to take the reins, not last year, not a year from now. The timing was basically dictated by these other circumstances, not necessarily my own timetable. The MMAA has seen hard times in recent months–turmoil in the leadership, a need for space to house the museum, not to mention the loss of momentum from the MMAA’s closing several months ago. What do you see as the lingering obstacles for the museum going forward, and how do you plan to tackle them? KM: Well, the biggest obstacle is clearly the lack of a building, so determining what will be the best space to house the next museum will be one of my first priorities. Hand in hand with that is raising support and money for the new museum and its programming. And this will mean reestablishing confidence that the museum can thrive–both fiscally and artistically–offering donors and supporters a program, a mission, a vision that is dynamic, distinctive, and doable. About the location: will there be a permanent home for the MMAA, and will it remain in St. Paul? About the artwork: are there plans in the works for allowing the public more opportunities to view work in the MMAA collection (and how much of it will be on view on a regular basis)? About money: has a new revenue stream opened up, or has the museum found a new philanthropic benefactor that turned the tide and assured MMAA’s future viability? KM: About the location: I think it is imperative that the museum stays in St. Paul. Minnesota’s capital city needs its own art museum, an art center that can be a real destination point for people across the region and beyond. A permanent home is the goal of both the board and myself. This is part of giving the museum an established identity that people can count on, year in and year out. About the artwork: The MMAA’s permanent collection is a major asset to the city and the state and will be seen on a regular basis. Of course, how often and in what capacity this happens will depend to a large extent on space considerations in a new building. However, it is my goal to refresh the public’s knowledge and appreciation of the museum’s permanent collection as part of the overall programming of the museum. About money: We have received an extremely positive sense from individuals, the city, local foundations, and corporations, that the continued vitality of the MMAA is important to the cultural life of the region. Many have committed funds to help us restart our operations and search for a new building. One of my big tasks will be to bring back supporters who may have committed themselves elsewhere and reignite the enthusiasm of new donors and philanthropists on both sides of the river. Given the abundance of art galleries and museums in the area, what do you envision the MMAA, under your leadership, will add to the scene? Put another way: Do you see gaps in the area’s exhibition and arts programming where the new-and-improved MMAA can step in and offer something distinct? KM: That was one big question I needed to answer before accepting the job, because why do something second best or as an also-ran to other established local museums? The Twin Cities are awash with great art museums, galleries, and art centers. What niche could the MMAA fill that would make it important, distinctive, and long lasting? One thing I saw missing was a museum dedicated to art of Minnesota and the region, both past and present. This is a focus that has actually marked the MMAA’s programming for a long time now. I want to ramp it up, provide more scholarly, in-depth exhibitions that focus on regional artists, consider the “state of the state” at regular intervals, offer more cross-disciplinary events and exhibitions, collaborate with other local arts organizations, coordinate with other museums from the region, that sort of thing. This doesn’t mean we will sideline the museum’s dedication to American art, which is a key component of the collection and the history of the institution. I think programming can include work of both regional and national artists; it’s all American, after all. What is your five-year vision for the reopened MMAA? How will the revived museum’s programming and exhibition line-up differ from what the museum has focused on previously? Specifically, do you see the MMAA continuing on as a regionally-focused contemporary art museum, or do you see this as an institution with possibilities in larger national and international art circles? KM: In five years, the plan is to have a thriving art museum in St. Paul, a center that people regularly visit to experience high quality, innovative exhibitions and events, educational opportunities, and even parties, openings, maybe even patio nights again, which were so successful at the last MMAA. My belief is that as long as you provide high quality programming, with vision, with integrity, with unique flair–whether that be more regionally centered or more broadly American–that the institution can be a model for museums and museum professionals anywhere in the world, museums that want to refocus their attentions on the talent and individuality in their own backyards. My main concern right now is reestablishing a museum that has this integrity, excellence, and commitment. At the moment, how that will be viewed nationally or internationally is not on the top of my list of priorities. I DO feel however that if you do things right, you can be a model for anyone, anywhere. Finally, what about the 2-D and 3-D Biennial exhibitions of work by local artists the MMAA has hosted over the years–will they go on? KM: I don’t know. I certainly feel the museum should engage recent trends and current work in the region, but perhaps there’s a better way to go about it. Nothing’s off the table at this point.